Lord Young today launches the Growth Vouchers Programme which will support more than 20,000 small businesses to take on expert advice. The programme will offer advice and guidance to the businesses taking part and will see subsidies of up to £2,000 being offered to many via a newly-created online marketplace. It will then monitor their performance over the coming years in order to assess the impact that advice has had. The single platform will make it much easier for businesses to find providers of strategic advice on key topics such as financial management, recruitment, leadership skills, sales and marketing, and digital technology. Aimed at businesses that have never sought business advice before, the programme is the largest business research project ever initiated by government and will gather comprehensive evidence on which to build future policy. The programme is being run as a randomised control trial (RCT) by the Department for Business, Innovation and Skills and the Cabinet Office’s Behavioural Insights Team. RCTs are widely regarded as a gold standard for empirical research. This is the first time an RCT has been run on this scale and aims to find out what sort of business advice is most effective for government to support. Businesses that have been running for a year, with fewer than 50 employees, and have not paid for strategic external advice in the past three years will be able to apply for support. They will then go through a process which will help them identify what sort of advice they might benefit from. Small business network Enterprise Nation has developed a marketplace for business advice where participants will then be able to find a qualified adviser. The new marketplace was built without any public sector funding and will be free for small business to use. It was funded by small business accounts and payroll software provider Sage, technology specialist Toshiba, co-working expert Regus, cloud-based collaboration and data sharing software provider Citrix, telecoms brand Vodafone, email marketing campaign brand Constant Contact and EDF Energy which are showing their support for small businesses by backing the initiative. It is also supported by professional bodies including the ACCA, ICAEW, BCS, CIPD, CMI and the CIM. The scheme comes in the context of record numbers of start-up businesses across the UK, with more 526,446 registered in 2013. 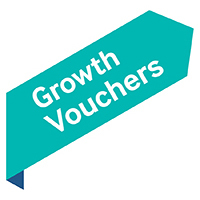 The Growth Vouchers programme will run from January 2014 until March 2015. Enterprise Nation is a small business network with more than 75,000 members. Its aim is to help people turn their good ideas into great businesses – through expert advice, events, networking and inspiring books. Enterprise Nation was founded in 2005 by Emma Jones MBE. Enterprise Nation is also heading up a new initiative which seeks to represent the needs of entrepreneurs, called the Entrepreneurs’ Alliance. It is an umbrella pressure group that includes the Federation of Small Businesses (FSB), the Federation of Private Businesses (FPB) and School for Startups, BusinessZone.co.uk and think tanks Centre for Entrepreneurs and The Entrepreneurs’ Network (TEN) which between them represent 2.5m businesses. We’re really looking forward to be a part of this scheme, the more small businesses we can help the more we enjoy our work. Uddannelse ændrer liv og forvandler økonomier.